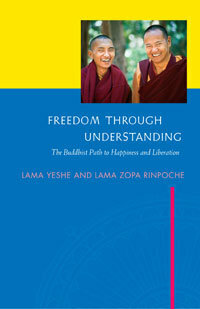 Freedom Through Understanding by Lama Yeshe and Lama Zopa Rinpoche is based on a seminar held during their first trip to Europe. They offered a weekend seminar based on their famous month-long Kopan meditation courses. Preceded by Lama Yeshe’s lecture on meditation at Kensington Town Hall, these teachings at Royal Holloway College, Surrey, encompass the entire Buddhist path to enlightenment.